For the third year, the Student Government Association will hold events where students and faculty alike will have a chance to sign the Inclusivity Pledge. From April 17-19, the SGA will be hosting three events in efforts to facilitate and encourage discussion of sensitive topics surrounding inclusivity. SGA Senator-at-Large, Breana Arnold, a junior studying political science, has been actively planning this year’s Inclusivity Pledge events. Her inclination is to assist in providing representation to all groups on campus in order to influence a positive environment. The Inclusivity Pledge events will kick off with a panel discussion on April 17. Clubs attending the panel discussion include athletic, health, gaming, political, multicultural and women organizations. Arnold said that the panel discussion will cover important topics such as mental health, sexual assault, immigration and military affairs. The following day, April 18, the library will be facilitating a Just Talk in honor of the Inclusivity Pledge. Arnold said that certain faculty specialized in topics concerning inclusivity and diversity will be in attendance to speak and food will be provided. On the final day of events, April 19, the Improv Club will be performing at Clyde’s. The team of improvisers will be carrying out material on the theme of inclusivity. Snacks will be offered at this event for guests. Although the Inclusivity Pledge has been present for the past three years, a signing of the banner and the presence of events leading up to the signing of the banner have been recent additions. In the first year of the Pledge, the act was to simply sign a sheet of paper in exchange for a smiley face pin and it received criticism for lacking substance. “You sign and move on,” said Arnold, explaining the conflict of signing a piece a paper not being enough to motivate a discussion or demonstrate the value of inclusivity on campus. The following year, the SGA added the Just Talk event in addition to the public signing of the banner. “Maybe having a discussion led by faculty on campus who are experts on these issues will get people to open up, talk and see the wrong in not being accepting of people,” said Arnold. Sierra Brown is an English literature major in her senior year and the current student body president. Brown said that before the Inclusivity Pledge was in existence and after the 2016 election, students informed her that they were “experiencing [discriminating] things in their classrooms” and began to “hear racial slurs from people coming up to them, shouting obscenities” influenced by the outcome of the election. With that information, Brown reached out to authority to discuss the next steps, and through connections, was able to convince CU President Bruce Benson to make the pledge available to all four campuses. “We hope it spreads past UCCS, outside into our [Colorado Springs] community, because we will be members of the community. In standing against the injustices at UCCS, maybe they will stand against the injustices found in the community as well,” said Brown, hoping this to be the future outcome of the Inclusivity Pledge. “The Inclusivity Pledge lets students know we hear them, we are a united campus and we are a community that does not condone hate speech or violence of any sort,” she said. The desire to encourage inclusivity and appreciation of diversity does not stop at the Pledge and its events. 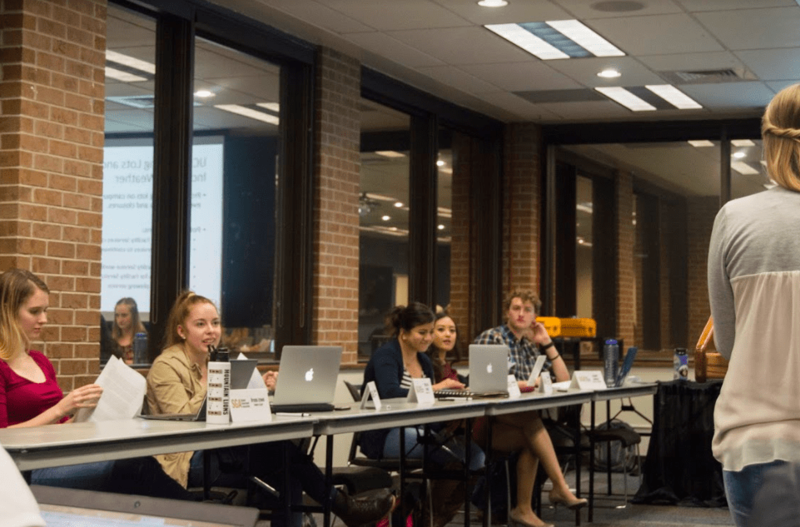 Members of the SGA have taken the first steps to begin an Inclusivity Club at UCCS. “If someone is passionate about diversity, inclusion, perspectives or any topics covered at these events, we’d love to have them join,” added Brown. Adeoluwa Remi-Afonja is a senior in communication serving as the SGA senator of multicultural affairs. She will be attending these events to support the annual initiation to promote a diverse campus. “We should all be tolerable and tolerant of everybody’s differences. It’s not necessary to come to a consensus in order to respect someone’s perspective/position and you don’t have to agree with someone to respect them as an individual,” said Remi-Afonja. “It’s about celebrating everyone entirety. It’s about, ‘I’m going to pledge as an individual to be inclusive for everyone.’” she concluded. The panel discussion will be held at the Chapman Recital Hall in the ENT Center on April 17 at 7:30 pm. The Just Talk event will be on April 18 from 11 a.m. to 2 p.m. on the 2nd floor Alps in the library. Improv Night will be on April 19 starting at 7 p.m. in Clyde’s. If you are unable to attend any of these events, keep your eyes peeled around campus. The banner regardless will be tabled on campus for individuals to sign. Moreover, the Pledge is available online at https://www.cu.edu/inclusive.